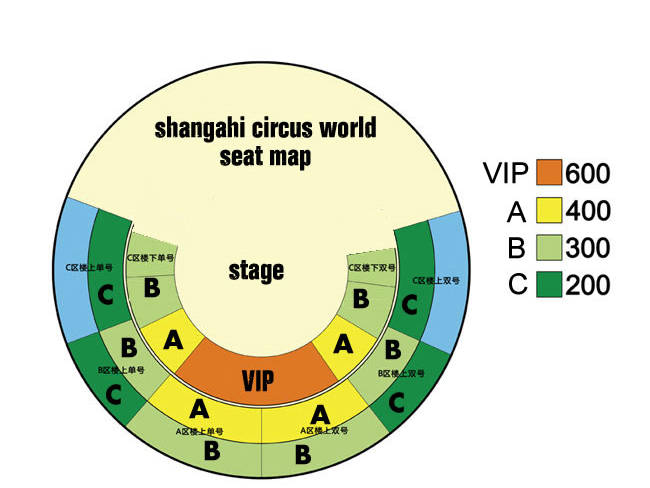 Shanghai Circus World, regarded as China's 'No. 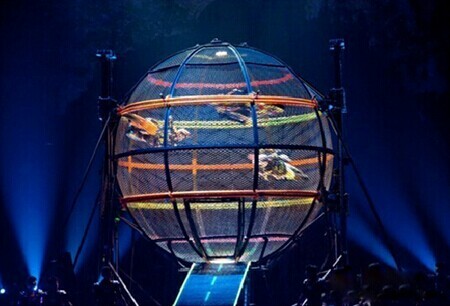 1 Circus World' is located in Zhabei District. Situated opposite the Zhabei Stadium to the south it is adjacent to Guangzhong Park to the north. It has a distinctive architecture with a splendid golden vault and can seat an audience of 1638. 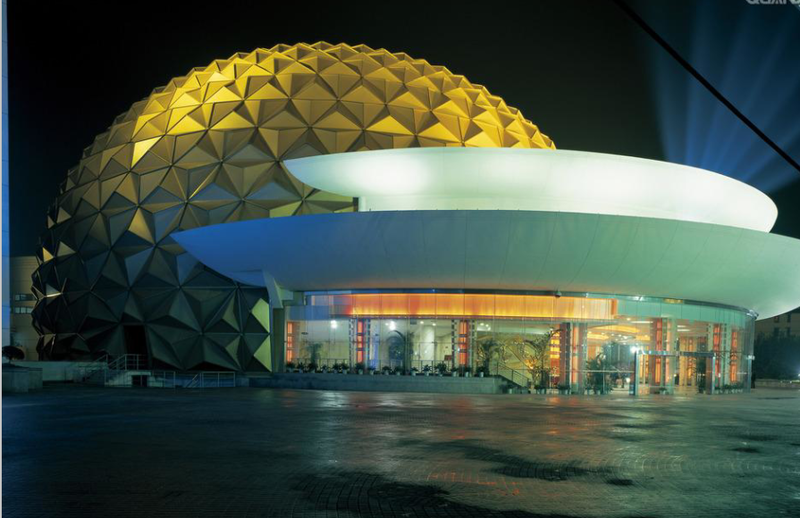 The advanced stage facilities, lighting and sound equipment enable it to be a comprehensive performance site, which holds domestic and international circus programs, acrobatics, singing and dancing performances as well as the Shanghai International Magic Festival & Competition. Transportation: Take bus nos. 46, 95, 114, 210, 253, 893, 912 or 916. Introduction: The Multimedia Theatrical Spectacular 'ERA Intersection of Time' has been performed since its debut at Shanghai Circus World in September 2005. It is unique and comparable to the tradition of the Broadway Musical. 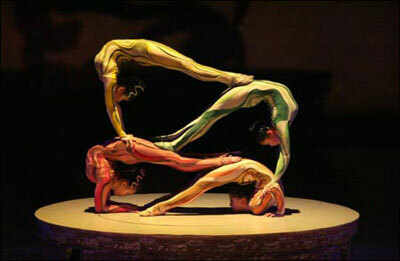 It is in fact a stunning acrobatic show combining traditional Chinese arts and modern technologies. The performers present Chinese acrobatics, martial arts and dance perfectly in harmony with the music, sound, lighting, and other special effects, which include a water screen. While you marvel at the highly proficient skills of the performers, the story of China's evolution from its ancient past to the future is told. Hence, the title 'Intersection of Time', as the viewpoint of the audience is set in the present between the past and the future. The performance provides a wonderful insight into China's ancient culture and civilization, with sections about Sinan, an ancient Chinese invention for telling directions, soothsaying and conjuring. There is a fantastic section showing an acrobatic program which has elements performed since the far off days of the Han Dynasty (206BC–220AD). With porcelain jars and vats as their stage properties the performers give an overview of Chinese porcelain culture and greater understand of the country's name of 'China'. Modern achievements that are also showcased include Shanghai Donghai Cross-Sea Bridge, Maglev Train, and Shenzhou 5, China's first manned space mission. From these, you can see the amazing development and bright future of Shanghai and the whole country. The 100-minute performance shows not only artistic skills, but also creativity. Aided by multimedia including vision, original live music, sound effects, smell effect, air conditioning and lighting, you will feel yourself transported to every scene. Calling a taxi during rush hour in Shanghai is not easy.so we can also provide car rental for transfer service.we can send a driver who speaks English (or chinese ) with a car or a van(1to 9 pax)to bring you to the theater .Please let us know the pick up place .car sevice charge is RMB 150 per group .For round trip service,bring you from hotel to the theater and after show bring you back to hotel, 300 yuan per group.you can Email us at hht@hzprivatetour.com to tell us the date,number of poople ,you will get a quick reply in 1 hour! Shanghai is widely known as the Oriental Pearl of China. As the most important city and one of the centers of global finance and commerce in the Far-East, Shanghai just has less than 200 years of history. However, as a center of China tourist destination, Shanghai has a much longer history any other international cities all over the world. Nowadays, Shanghai is the most popular city for traveling, and Shanghai tour has been a calling card of China tourism.Hangzhou Private Tours Studio with many years of providing the professional Shanghai tour packages is also specialized in offering the service of Shanghai private tour. The landmark attractions of Shanghai include The Bund of Shanghai, Yuyuan Classical Garden, Shanghai Museum, Nanjing Road, Shanghai Global Financial Center, Shanghai Oriental Pearl Tower, and so on. Furthermore, the tourism-related service is the most developed in mainland China, and another highlight of the Shanghai city tour is its night life, which is typically available in Shanghai Xintiandi and Paramount Night Club.The fantastic view and fashionable lifestyle of Shanghai is always your first choice when you plan to have a classic China tour.